It was a crisp fall day in the mountains of Virginia almost 100 years ago, when my cousin Lelia Cockram, age 16, and her little sister, Kittie, age 13, went to pick apples up on the mountain. Kittie was up in the tree throwing apples down to Lelia when she saw a man approach them. She recognized Oliver Reynolds, a man working in the area who began making comments to Lelia about coming with him and being his girl. Some say she had shunned his advances before. 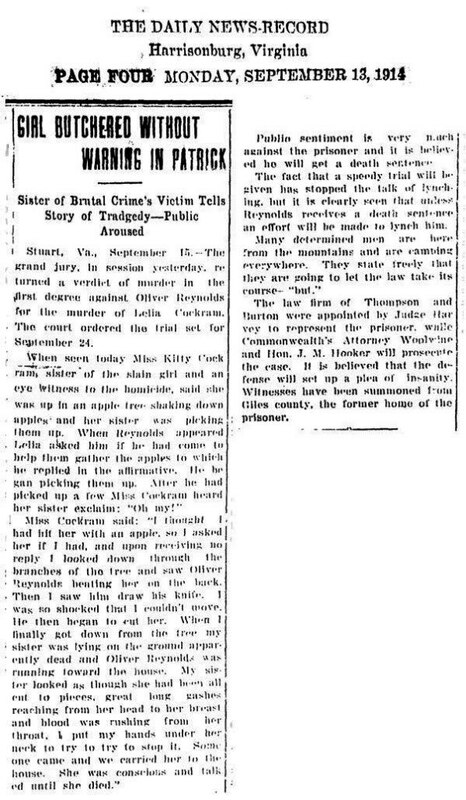 According to a newspaper article printed in the Daily News Record of Harrisonburg, Virginia on Monday, September, 1914, Kittie testified that she heard her sister ask Oliver Reynolds as he approached if he had come to help them pick apples, and he answered in the affirmative. The next thing Kittie says she heard, was her sister saying “Ow, stop!” Kittie thought maybe she had hit her sister with an apple and peered through the branches to see Mr. Reynolds hitting her sister on the back as she bent over. Then Kittie said she saw him draw a knife and begin cutting her sister! He stabbed Lelia in the neck! Finally he ran away! Kittie came down and tried to staunch the flow of blood from her sister’s neck. Her screaming attracted attention and men came to help carry Lelia to the house. Kittie testified that Lelia actually talked to them until she died! Lelia’s promising young life was ended on the mountain that day September 7, 1914. That area in Patrick County, Virginia was a close-knit community, many of them kinsfolk. Oliver Reynolds was easily apprehended, the problem was to protect him from the lynch mob that wanted to hang him. Leila’s father John “went a little crazy” for a while after her murder, what parent wouldn’t have? And what of her mother and fourteen siblings, especially Kittie? Kittie grew up to marry a state congressman, Charles Langhorne “Tump” Spangler and have seven children, but always remained sad and had nightmares regarding her sister’s murder! Today we would say she suffered from PTSD after such a terrible crime! In September 1914, in another county for safety of the prisoner, Oliver Reynolds was sentenced to life in prison, Kittie had to testify. On the 1920 census, he can clearly be seen as an inmate in prison in Goochland County, Virginia. One report claims he died of tuberculosis while imprisoned sometime after 1930. However, I have not been able to locate him in a Virginia prison on the 1930 census, so I suspect he died before 1930. How sad; his was a wasted life. At 16, Lelia was already a teacher in rural Virginia. She was well-educated as many young girls were not. For the sake of my cousins and siblings, I am including a relationship chart for our kinship to Leila and Kitty Cockram. 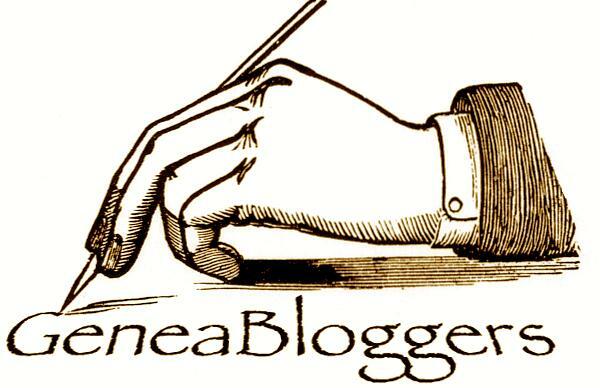 Thanks to many of my cousins, especially Harvie Spangler, Kittie’s son; Beverly Belcher Woody, Patty Lawson Kiser, and Betty Lawson Lawless for giving me information for this story. Categories: Cockram family posts, Genealogy, Spangler Family posts | Tags: Crime and Justice, Genealogy, murder, Patrick County Virginia | Permalink. Thank you for sharing this part of your family story. What an awful thing to see done to your sister. I am sure it haunted her for the rest of her life. The family as a whole must have thought about it every season the apples were ready to pick. Helen, you did a great job with the story. I am glad that you found out some information about Oliver. It has always been passed down that he killed two people while in prison. He was a horribly violent person and she was a beautiful, innocent girl. So sad…. 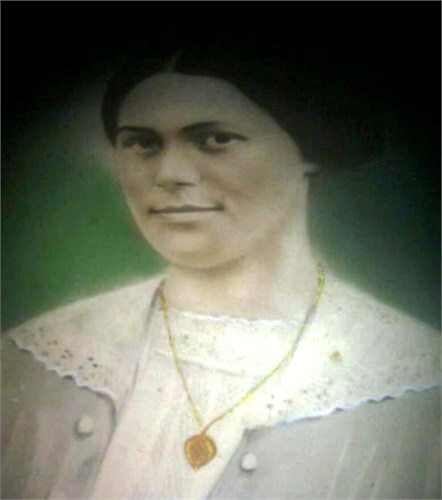 Leila’s sister, Minnie Susie Cockram Elliott, is my grandmother. Susie, the youngest, is now 105 years old. All the Cockram siblings seem to have lived into their 90’s or further, but of course, this lovely girl did not have the chance. Grandma Susie, as I call her, always speaks of this sad story. She was only five at the time, and the way she tells it, she also witnessed the murder, although the newspaper articles do not say that. (perhaps because she was so young) I can only imagine how enraged this community was. When I look at Leila’s picture, I see such a resemblance to Susie and of course Kitty, who is now deceased but I remember her as I am Susie’s oldest grandchild and we visited her in Meadows of Dan often when I was a child. Many of my cousins also resemble her. What a sad life cut short!